The most common cause of disability and death among Georgians is heart disease, but its toll is decreasing. According to a recent study in the journal American Family Physician, just 6 percent of Americans had coronary heart disease in 2010 compared to 6.7 percent in 2006. A separate recent study from The New England Journal of Medicine found that the number of heart attacks in the United States decreased between 1999 and 2008, and among those who had heart attacks during that period, the percentage of those who survived them increased. Experts offer many explanations – better diets and lifestyle habits, improved screening and detection methods, better and more medications and, importantly, advances in surgical treatment for problems such as blocked coronary arteries, faulty heart valves and aneurysms at risk of rupture. For many Georgians such procedures are becoming more accessible and a bit easier. Many procedures that once required opening the chest – which meant significant pain, hospitalization and a lengthy recovery – can now be done in less invasive ways that reduce pain, trauma and recovery time and in some cases make them feasible for patients who could not withstand more invasive surgery. Here are six potentially life-saving procedures – some still experimental and some almost routine – available in Georgia now. When plaque accumulates in arteries, over time that accumulation can restrict blood flow to the heart, leading to a heart attack. A coronary artery bypass graft allows surgeons to bypass the blocked portion(s) of an artery or arteries with grafts of blood vessels from other parts of the body, typically the leg. While the procedure has become less common in recent years due to the advent of balloon angioplasty and the placement of stents (see below), for many it remains a life-saving treatment option. And for those who need it, new techniques, using small incisions and in some cases eliminating the need for a heart-lung machine – a pump that maintains the circulation during heart surgery by diverting blood from the heart, oxygenating it and pumping it through the body – are making the procedure a little easier for patients. “About 10 to 15 percent of patients will qualify for a procedure called a beating heart or off-pump operation,” says Robert E. Jones, M.D., a heart surgeon at Memorial University Medical Center in Savannah and clinical assistant professor of surgery at Mercer University School of Medicine. “With a beating heart [procedure], we don’t have to dilute the blood as much and you don’t have to stop the heart, and there is some advantage to that.” The primary benefit, he says, is a small improvement in neurologic outcomes including a decreased risk of stroke. While surgeons once hoped that most bypass operations could be performed off pump, experience has shown that this kind of surgery is best reserved for patients requiring bypass of a vessel on the front of the heart, says Dr. Jones, because moving the heart to replace harder-to-reach vessels causes the blood pressure to drop. When possible, doctors try to use a vessel in the chest called the internal mammary artery, also known as the internal thoracic artery, for the graft. For other vessels, they typically use veins from the legs, which once involved long incisions down the leg, a painful surgery with a 15 percent complication rate. A new procedure, however, called endoscopic vein harvesting (EVH), which uses a scope and small incision to remove the grafts, reduces both pain and risk of complications for patients. For many people, the need for bypass surgery has been eliminated by balloon angioplasty and the use of stents. First performed on a coronary artery in 1977 by a German-born Emory physician named Andreas Gruentzig, balloon angioplasty has traditionally involved running a tube with a small balloon mounted on the end through an incision in the groin. Once the tube reaches the blocked artery, the physician inflates the balloon to open the blockage. For the first few decades the procedure was performed, this required having a surgical team on standby in case the artery tore and shut down, necessitating emergency surgery. The development of stents, which are placed in the arteries during angioplasty to support and hold them open, has largely reduced that risk, says Chad Huggins, M.D., a cardiologist at Mem-orial University Medical Center. The development of better stents as well as new ways of placing them is improving the procedure for many patients. At Savannah’s Memorial Uni-versity Medical Center, doctors are placing stents using smaller incisions in the wrist, through a technique called transradial catherization, rather than through the groin. “The advantage is that you have fewer bleeding complications, and it is also more comfortable for the patient,” says Dr. Huggins. “After the procedure you can sit up right away.” The procedure is also safer for obese patients because wrists are usually relatively small, so there is less tissue to cut through. Some of the biggest advances in reducing the trauma of heart surgery are in the repair and replacement of the valves that regulate blood flow into and out of the heart chambers. When heart valves are defective or break down or calcify with age, blood flow can be affected, leading to problems such as shortness of breath, chest discomfort, congestive heart failure and loss of consciousness. Surgical repair of the valve or replacement with a mechanical valve or a natural valve from a cow or pig can prevent or relieve those problems. In the past, valve surgery typically required a sternotomy – a procedure in which the surgeon makes a vertical incision along the sternum, or breast bone, and then divides or cracks the bone to open the chest. Today, however, repair or replacement of the mitral valve, the valve between the left atrium and the left ventricle of the heart, can be performed using minimally invasive techniques. Other surgeons are repairing or replacing mitral valves not through the front of the chest but through the right side of the chest, thanks to technology that allows doctors to connect the heart-lung machine to the leg artery and vein so that they don’t need a big incision in the front of the chest to connect it, says Douglas Murphy, M.D., chief of cardiothoracic surgery at St. Joseph’s Hospital of Atlanta. 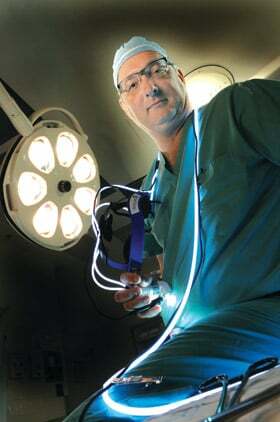 The incision through which the procedure is performed is about the length of a silver dollar – large enough for doctors to insert a single shaft of instruments into the chest cavity, says Alan Wolfe, M.D., who performs minimally invasive surgery at Northeast Georgia Medical Center in Gainesville. A separate wound in the chest allows the surgeon to position a videoscope inside the heart. “When I operate, I am actually not looking down a little small hole in the chest, but I am actually looking at a video image on the screen, which is much better than you can see with your naked eye,” says Dr. Wolfe. “That is actually a better way to operate on the valve because you are approaching the valve from a lateral approach. “This is truly minimally invasive for the patient, because the patient wakes up with little or no pain because there is no bony trauma,” says Dr. Wolfe, “and they have a cosmetically pleasing operation.” Furthermore, he says the recovery period is reduced from six to eight weeks or more for an open procedure to 10 days or less for many people. At a handful of hospitals around the nation, including St. Joseph’s Hospital of Atlanta, doctors are repairing or replacing mitral valves with the da Vinci robotic surgical system. The system is operated by a surgeon sitting a few feet from the patient at a console. Using a high-powered camera, the surgeon guides the arms of the robot that holds surgical tools, which are inserted into the patient through small, keyhole-sized incisions between the ribs. Dr. Murphy attributes the low complication rate to the facts that physicians carefully study the patient’s blood vessels with a CT scan prior to surgery, the surgery is performed under a carbon dioxide environment because carbon dioxide dissolves in the blood, and the robot magnifies so greatly – 10 to 12 times with the robotic camera – that doctors can see and remove tiny bits of debris that might otherwise get into the bloodstream and potentially land in the brain. One of the original centers for research with the da Vinci robot, St. Joseph has done some 1,200 of the procedures since 2002, says Dr. Murphy. As with the mitral valve, repair or replacement of the aortic valve – the valve between the left ventricle and the aorta, which prevents blood from flowing from the aorta back into the heart – traditionally has required split-ting the breastbone to access the heart. But like other procedures, aortic valve surgery repair or replacement has become less invasive in re-cent years, as some doctors are spreading the bone only minimally, says Dr. Wolfe. For patients who are very sick and unable to withstand surgery, a new procedure called transcatheter aortic valve replacement (TAVR) – known among cardiologists informally as “valve on a stick” – involves placing a collapsed replacement valve through the femoral artery of the groin, threading it up to the heart and deploying it under X-ray guidance. Five-year data from the procedure are positive, says Prad E. Tummala, M.D., a cardiologist at Northeast Georgia Medical Center, one of just two hospitals in Georgia (the other is Emory Hospital) that performs the procedure. “You need to treat only three people to save a life,” he says. “If you look at the progression of the disease, typically three out of five don’t survive to two years if you don’t do anything.” With TAVR, however, three of five can be expected to survive to two years, and some people live eight or nine if they have no serious health problems aside from valve disease, he says. So far, the procedure is reserved for only the sickest patients, and while it is performed at only two hospitals in the state, others, including South Georgia Medical Center, are expected to offer it soon. An aneurysm is a balloon-like bulge in the artery wall that occurs when an area of the wall weakens and the pressure from movement of blood through the artery causes the weakened area to swell, often to the point of bursting and causing potentially fatal bleeding in the body. Repairing an aneurysm traditionally has involved replacing the weakened section of the artery with a graft or patch through a large incision; however, doctors at South Georgia Medical Center are repairing aneurysms in the abdominal aorta less invasively in an endovascular fashion, says Dr. Saint. Like many other less-invasive procedures, the repair involves making a small incision in the groin. The Y-shaped tube grafts to replace the abdominal aorta are then passed up over wires into the aneurysm and deployed using balloons in similar fashion to coronary stent deployment, says Dr. Saint. “The technique has become fairly standard for us now, and we are doing half or maybe a bit more that are repaired with that technique as opposed to the old open technique,” he says. For people who have trouble with blood pressure control despite treatment with multiple medications, an experimental procedure offered by Emory may offer new hope. The catheter-based approach delivers several areas of focal radiofrequency treatment to arteries of the kidneys to silence the nerves that cause an excess surge of adrenaline that raises blood pressure. Studies of the procedure overseas have shown a drop of 20 to 30 points on average for patients who have the procedure on both kidneys, says Chandan M. Devireddy M.D., assistant professor of medicine at Emory University School of Medicine, who is leading the study at Emory. He says the other potential benefits for the therapy may include better control of congestive heart failure, diabetes and abnormal heart rhythms.